Prime Minister Imran Khan here on Friday said that development and reconstruction of Balochistan was top priority of the Pakistan Tehreek-e-Insaf government, which was evident from province’s enhanced share in the China-Pakistan Economic Corridor project. 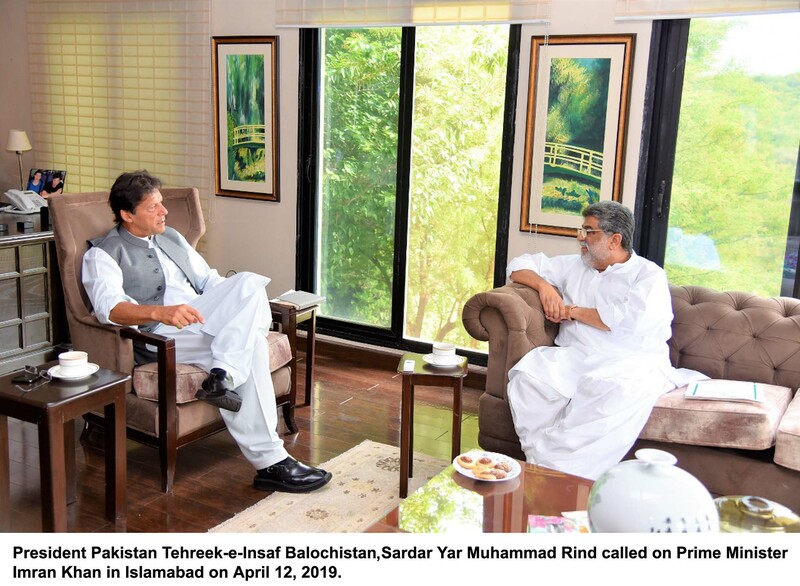 Talking to PTI’s Balochistan chapter President Sardar Yar Muhammad Rind, who called on him in Islamabad, Pm Imran said that the federal government would fully cooperate for the resolution of problems being faced by the people of Balochistan. Construction of dams, Kachhi canal project and other issues were also discussed in the meeting. Moreover, Prime Minister Khan directed the authorities to ensure protection rights of labourers and domestic servants across the country. During a meeting to review implementation on labour laws, the prime minister was briefed on labour policies introduced by Punjab and steps taken for their welfare. PM Khan lauded the provincial government of Punjab for its measures for provision of rights to labourers. He asked the officials’ concerned top ensure implementation on laws enacted in this regard. He said it was not suffice to enact legislation for ensuring rights to the labourers, but implantation on the laws was equally important. The real challenges in enforcing the law in letter and spirit, he added. Imran Khan said protection of labourers’ rights was a legal, religious and moral obligation. He said the government was taking steps for the downtrodden irrespective on any political interest. Prime Minister Khan also highlighted that the biggest plots’ auction organised by Capital Development Authority (CDA) [Islamabad] resulted in ‘highest ever return’ of Rs11.28 billion. In his Friday’s tweet, PM Imran Khan praised organisation of the four-day plots’ auctioning event by the development authority in Islamabad, the decision which has generated a handsome amount of profit for CDA.